And Get Your Information Direct! Professionals frustrated with searching for public records can now get accurate and current information on how to obtain records directly from the source. The 10th edition of The Sourcebook to Public Record Information profiles in detail over 20,000 government agencies that house public records. More than a directory, the agency profiles found in The Sourcebook include access procedures, access restrictions, fees, online capabilities, turnaround times, along with addresses, phone/fax numbers, and additional information. At your fingertips is how to access criminal and civil records for all 3,000 plus counties in the USA. Essential contact information is given to each and every county criminal and civil records office and what you have to do to access the record (by phone-mail-fax-or online). There is even a cross-reference section so you can quickly determine which county to go to for records procurement for any address in the USA. Just like your major secret weapon to accessing civil and criminal records on a county level, this sourcebook gives you the same data for quickly accessing state criminal records repositories, state corporate records, State occupational licensing, DMV information, sexual predator record sources, state incarceration records, worker's compensation records and much more. Just look up the state and you gain instant access to the state public records. Aside from county and state records access, this sourcebook gives you instant access to federal public records of all types. 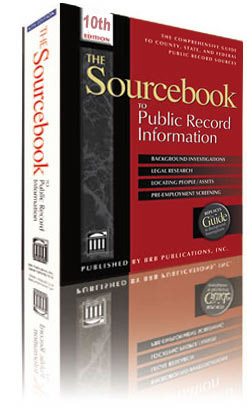 In fact, this sourcebook gives you access to over 20,000 sources of public information. • More Direct Telephone and Fax Numbers – To help you connect, hundreds of direct telephone and direct fax numbers are being added. • Copy Fees – Indicates copy fees for self service, court personnel searches, civil and criminal records. • Public Access Terminal – Indicates if the terminal offers an index to civil, criminal or both, PLUS how far back the records go for civil and for criminal. • Court Certification Fees – Clarified to indicate if copy fees are included in the Certification fee or not. This extensive guide of over 1,900 pages is a superb time saving and cost cutting resource for background investigations, legal research, people/asset location and background screening.